Crispy Sesame Chicken is easy to make with super crispy batter and delicious sesame sauce you’ll skip the takeout! To make the sauce mix all the ingredients together and to prepare the batter, add the ingredients together until just combined. Add the chicken pieces to the batter and coat while heating 3 inches of oil to 350 degrees and add the chicken to the oil in batches frying until golden brown. In a large wok or skillet add the sesame oil to the frying pan and add the garlic and red pepper flakes and cook for 30 seconds. 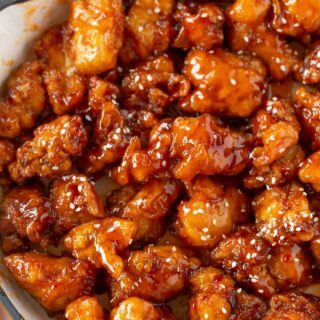 Add in the sauce and the chicken and coat quickly and serve immediately, garnished with sesame seeds.